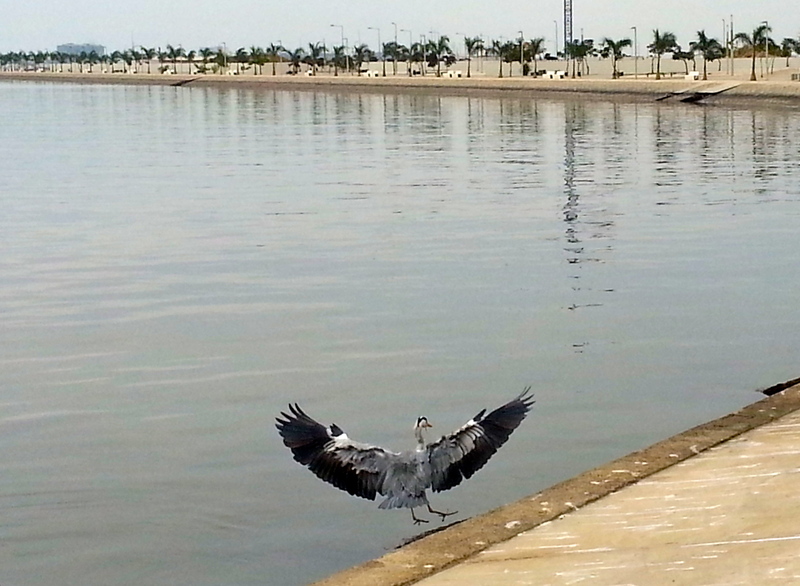 There is always something interesting to see in Luanda. The landscape of the city is changing rapidly, with huge skyscrapers going up everywhere you look. 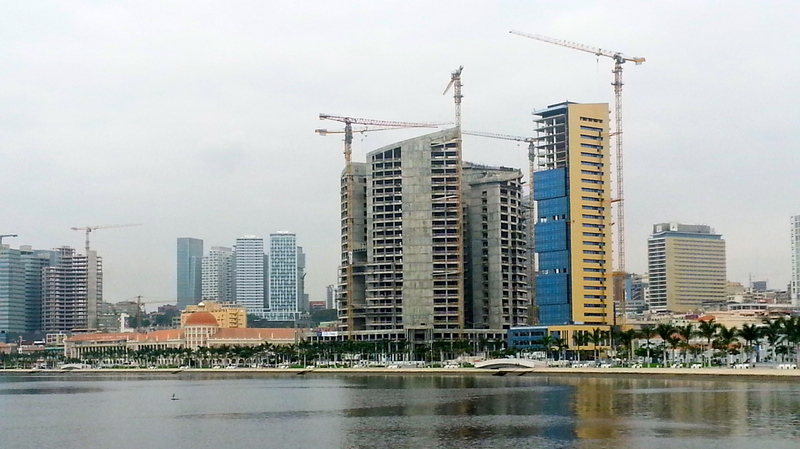 Ten years from now, Luanda will be unrecognizable. I won’t be here to see it, of course. My days in Angola are limited, and that is why I look around with such interest. That, and the fact that it is so very different from any place I have been before. To that end, Hubby and I enjoy walking along the Marginal on the weekend. Despite the occasional waft of cringe-inducing odors from the bay, it is a great place for people-watching and helps alleviate the claustrophobia caused by living within eye-shot of the office. Currently, there are dozens of photographs from around the world displayed along the walkway. This may seem like no big deal, but this city only has three or four museums. They are all focused on Angolan history and not readily accessible to the average Joe. One of them that I visited, the Natural History Museum, is locked behind tall iron gates. It is only open occasionally and rarely has electricity. It is very good to see something available to the average citizen free of charge, that also offers a bit of education about the rest of the world. 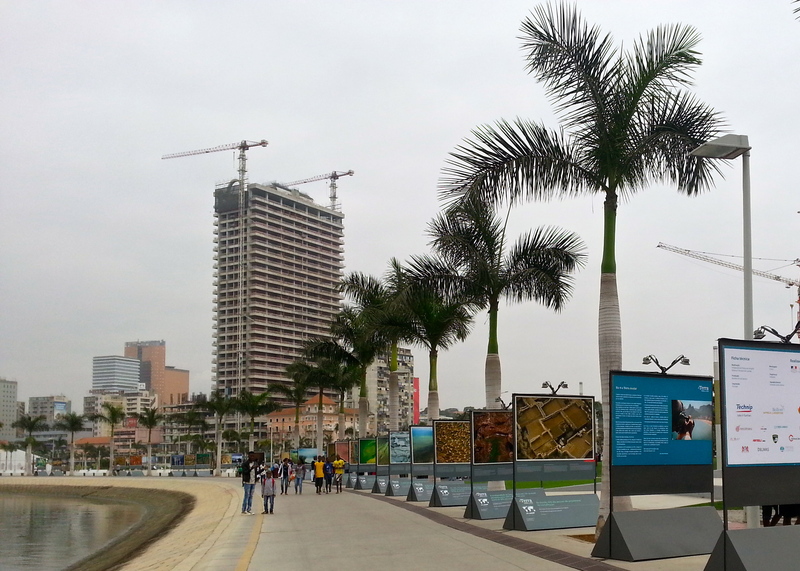 Luanda Marginal – Lovely photo display from around the world. 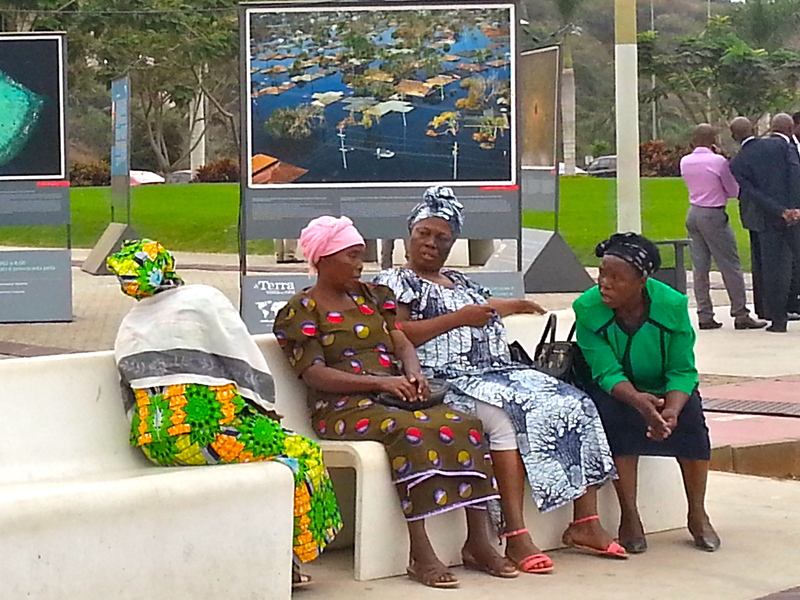 Luanda Marginal – Local ladies enjoying the day out. A building frenzy! Skyscrapers are popping up like mushrooms in this city. The bay, although terribly polluted, is full of small fish and turtles. The bird population has a ready source of food here. The section of the Marginal walkway seen in the background has been completed for many months, but has not been opened yet. Once opened, it will add at least a mile to the path. Today, my driver Jesus and I headed up to one of my favorite grocery stores, called Valoeste. It is in a higher-income part of the city, where many of the embassies are also located. 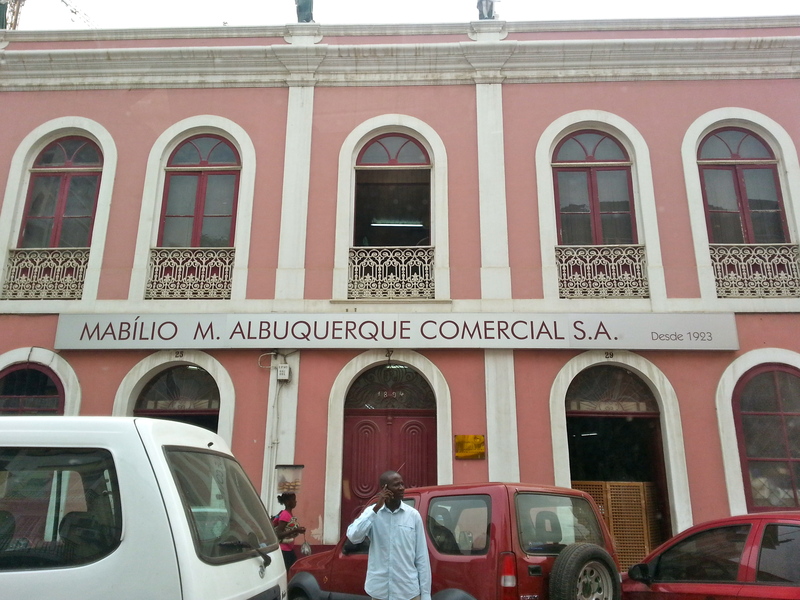 Most of the people who shop at Valoeste are wealthy Angolans and diplomats, so the store has a very extensive selection of imported and hard-to-find items. I am always amused at the behavior of some of the wealthier fellow shoppers I come across. Invariably, if I am bagging up a larger than normal amount of something – anything – it always attracts a crowd. Before I know it, I will be pushed aside as three or four other ladies will suddenly decide they need the item too, despite the fact that they had ignored it a few moments before. It happened again today. I was bagging up sixteen apples to take to the orphanage tomorrow for my students. All of a sudden, another woman nearly knocked me over in her quest to get the apples first! I just laughed and held my ground until I had finished bagging up what I needed. It has happened so many times, I’ve come to expect it now. Besides, I was younger than she was, so I was pretty sure I could win in a fight, if it came to that. 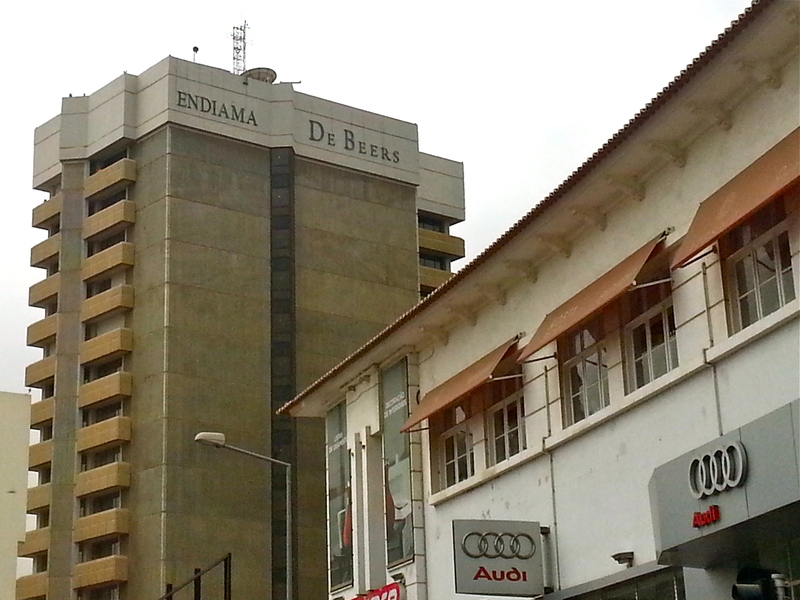 DeBeers Building – a reminder of the wealth in this country. Of course, there is a luxury car dealership next door, in case a diamond merchant needs to buy a new car on his lunch hour. The government buildings here are all quite fancy and ornate. Meanwhile, the city is surrounded by an enormous shanty town. One of my favorites, Albuquerque. It reminds me of Tuesday Morning. You never know what they will have, from sewing notions to kitchen items. Now that I have been here for almost a year (can’t believe it has been this long! ), I feel much more comfortable making my way through this concrete jungle. It does get exhausting at times, fighting for survival (and apples), but what a great experience it has been! Seeing another side of the world, so very different from the US, has opened my eyes in a way I never thought possible. I’ve learned some valuable survival skills, too. The next time someone tries to steal my produce in a supermarket, they might just find themselves taken down. Hakuna Matata, my arse. That’s only for Disney movies! Going to the grocery store should not be a hazardous activity, but here in Luanda, there are pitfalls and stumbling blocks everywhere you go. Just today, as I was walking out of the grocery store, to my left stood a soldier with a machine gun. To my right, several men walked quickly towards me, sizing me up and shouting in Portuguese. I assumed from their demeanor that they were asking for money, which quickened my steps. Just as I approached the passenger side of my vehicle, with my driver inside and engine running, I narrowly missed falling into a three-foot-wide, six-foot-deep, open manhole. This could have been the end of me. Going to a hospital here is as dangerous as any accident. No, Luanda is not a safe place for a klutz like me. I fall down – a lot. A bad ankle is the usual excuse for these spills, but mostly I am just too distracted by what is around me to watch where I put my feet. My favorite story about this legendary klutziness recalls my first date with the cutie-pie who would later become my husband. He is one of the most graceful and athletic people I know, by the way. It was a date to go water-skiing. Don’t get ahead of me, now. The two of us had been set up on this date by another couple. The girl was a friend of mine from grad school, and her boyfriend was one of my hubby’s co-workers. Everything was going along perfectly until the two guys tried to launch the boat from a very steep boat ramp, something both of them had done many times before. Suddenly, the boat launched itself off of the trailer and began to float away. While all of this was going on, I was walking towards the water, enthralled with all of the commotion, and of course my hot date. The next thing I know, I am flat on my back laying in dead shrimp. While I had been gawking at my hubby, I had stepped right off of a four-foot embankment, and landed right in the middle of two young boys who were fishing with the stinky shrimp I had just squashed. Not one to admit pain, I jumped right up and declared, “I’m Oookayyy!”, doing my best arms-in-the-air, Olympic dismount gesture. How embarrassing! Here I was wearing my brand-new bikini, preparing to dazzle this handsome guy with my skiing prowess, and I fall down like a bumbling idiot. One thing is for sure, I made an impression that stuck. We did wind up getting married, after all. Years later, my husband told me that his first thought was, “She’s clumsy, but she’s tough!”. All of this is to say that I am ill-equipped for life in such a hazard-filled place. There are no clean, even sidewalks here. There are holes and rocks and mud puddles. The mud puddles especially need to be avoided. You don’t want to know what is most-likely floating in them. I’ve found the best shoes to wear here are FitFlops, those very unattractive rubber platform sandals that allow for walking slightly above the muck and can be hosed off and disinfected later. In addition to concentrating on all of the hazards on the ground, one must also watch out for hazards coming from all sides: crazy drivers that have no intention of stopping, potential muggers and the occasional stray dog. Sometimes, it is just too much for my ADD mind to handle! In all seriousness, while I speak of Luanda as an urban minefield, there are many real, actual minefields still remaining in this country, mostly in outlying communities. In fact, Angola is still one of the most heavily land-mined countries in the world. Following the end of the decades-long civil war, many land mines have been removed, but an estimated ten million still remain. Let that number sink in a moment. Ten million land mines. Imagine the damage they can do. And they are not designed to kill. They are designed to maim. Many, many people are seen with missing limbs, even in Luanda. It is a terrible tragedy that is entirely man-made. Of course, a klutz like me would be more of a danger than a help in clearing land mines. There is not enough protective gear around that would make me safe in such a situation. But, I can certainly contribute monetarily and plan to do so. 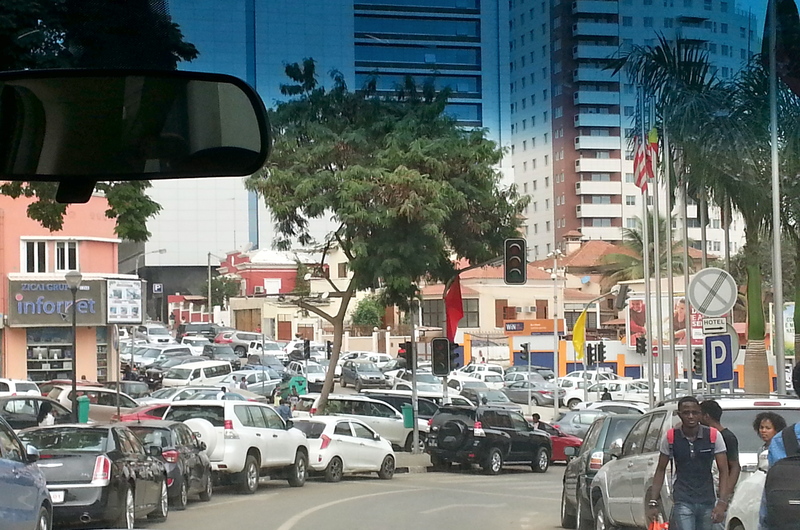 In the meantime, I will be stepping very carefully as I travel around the city of Luanda. 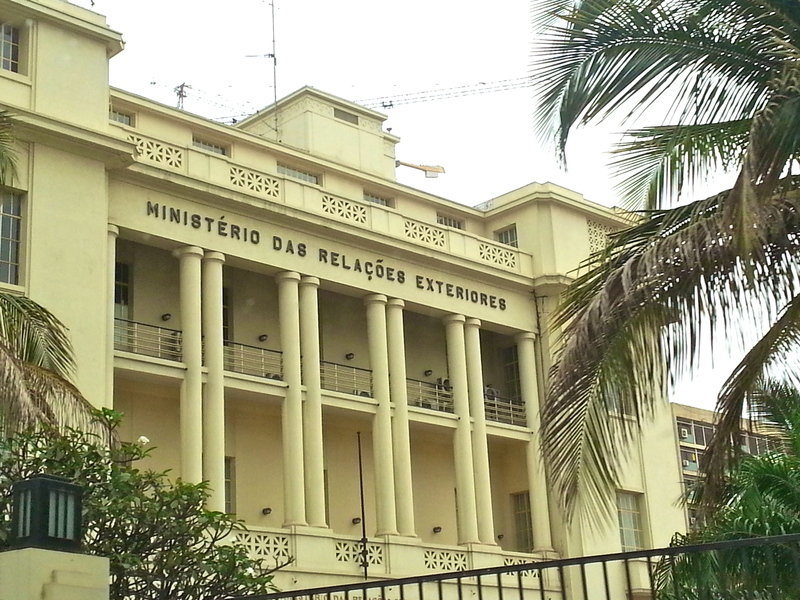 As interesting as it could be, I don’t really want to write a blog about an Angolan emergency room, thank you very much. Now, back to that water-skiing trip. I am happy to report that I did dazzle my date, and the other couple too, with my skiing prowess. In fact, with each fall – and there were many – those comedians on the boat yelled out, “That’s a 9.5!” or “That’s a 10!” Yes, I did fall spectacularly, but I also got back onto those darn skis until my date, with his infinite patience, had finally taught me how to slalom ski. And I didn’t even lose my brand-new bikini top in the process.